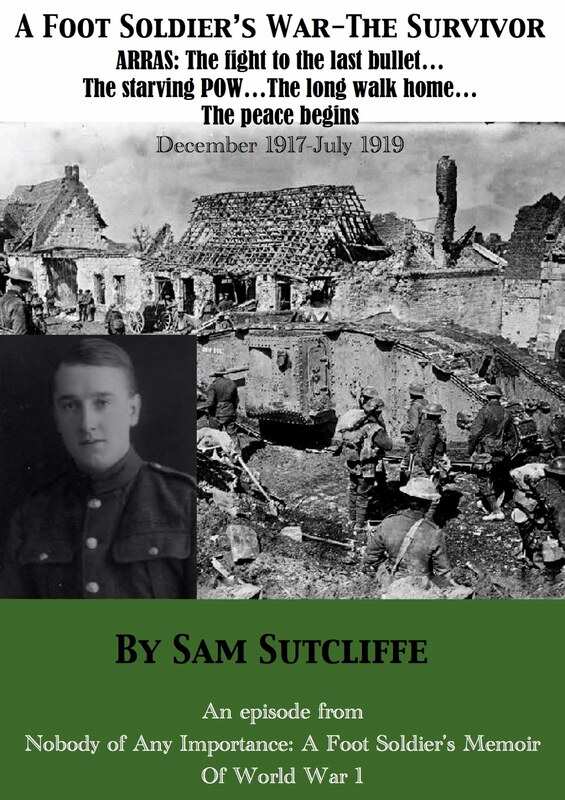 Sam – still under age after Gallipoli & Somme – sent back to Blighty… and good news of brother Ted! A hundred years ago this week… With the Western Front hibernating bar the odd raid and artillery eruption, the German air force brought British civilians into the action more than usual – though on a relatively tiny scale, of course – with Zeppelin raids on Hartlepool and Yarmouth resulting in four deaths while costing two airships shot down by British fighter planes (November 27), and a rather strange first-ever daylight raid on London by just one German plane, causing 10 injuries (28). Further, off Devon, a German U-boat attacked the Brixham fishing fleet. Despite the weather, the Eastern Front growled along with the Russian and German Armies battling on in Galicia and Bukovina to no conclusive effect. But the main European action occurred further south. The Battle Of Bucharest (November 27-December 6) focussed all the forces gathered by Romania’s entry into the war on the Allied side through the ultimately failed Battle Of Transylvania (August 27-November 26). The more peripheral participants, Russia and Bulgaria (for the Central Powers) both had their successes during the week – the Russians in the Carpathians defending the Jablonitsa Pass. But the German, Austrian and Turkish Armies closed in on the Romanian capital via the Battle Of The Argeş (December 1-3) where the troops assembled around said river totalled 325,000 and the Romanians suffered a crucial defeat – although better remembered (perhaps like on of Britain’s “glorious failures”, the Charge Of The Light Brigade) seems to be the Prunaru Charge wherein the 5,000-strong 2nd Roşiori Cavalry launched a counterattack in the Teleorman river valley only for German machine guns to mow them down so ruthlessly that just 134 survived. Elsewhere, steady Serbian-French-Russian-British advances continued in Macedonia (the Monastir Offensive, September 12-December 11) and yet another branch of the overstretched yet always combative Russian Army drove Turkish forces back in Persia (November 27 onwards). Last week, a new arrival at Harfleur camp gave my father worrying news about his older brother and former 2/1st comrade Ted – last heard of somewhere on the Somme about to charge out into No Man’s Land to rescue a wounded Sergeant. 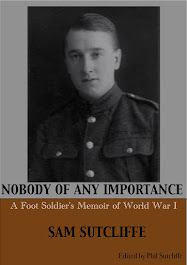 But in other respects Sam had started to enjoy his life in the mundane, peaceful world of unofficial Army catering – his old Fusiliers comrade Archie Barker’s canteen (profits to the Captain Quartermaster) which offered tasty extras like tinned-salmon sandwiches and apple turnovers the Tommies gladly purchased for a franc or two. ‘In the canteen, I found one new development rather disquieting. After all, I had initiated this system of buying goods in the town from the French civilian dealers in hopes that it would establish itself permanently. I have mentioned those apple fritters as one great success with the troops. Well, another baker called at the canteen when I was out, offered Barker a lower price for them, and he accepted. When I sampled one of the first delivery, I didn’t think it matched the taste or quality my friend in Le Havre supplied. I said so, but Barker didn’t like this, he was the boss and he decided, so… nothing I could do about it. One or two other points of friction arose, but knowing only too well the fragile nature of my job there, I didn’t press my arguments. Nevertheless, the old friendly atmosphere faded. The basic reason may have been Barker’s fears for his own position. A fit man, in his thirties, he should have been up at the Front. Naturally, he’d do everything possible to retain that job at the base, away from all the horror and agony. So when, one day, it was decided I should return to England – for other duties, not on leave – I was mentally prepared for another move. No doubt I was delighted too, inwardly, although in part sorry to leave this life bearing so little resemblance to that of a soldier… the congenial relationship with Marie-Louise and her mother, the market people who knew me, the chummy drivers. In England this would be exchanged for who-knew-what? The crossing from Le Havre to Southampton took much longer than the Dover-Calais ferry**, about eight hours. Then I boarded a train to London where I had to report to the HQ of our old Royal Fusiliers Battalion at the Bloomsbury depot where I had enlisted*** – a circle nicely completed. In charge there, I found an officer, Lieutenant Hudson, who had been with us back then, in autumn, 1914, and a Sergeant I didn’t know, an oldish chap, soldiering on in a quiet number. I gathered the Lieutenant had not left London during all that time. That’s what the Sergeant implied, though it may have been wrong. Anyway, during the rest of my stay I saw little of the Lieutenant. “You’ll be billeted at home and report here every morning at nine,” the Sergeant told me. Another nice change. I couldn’t help constantly thinking back to the dirt, horror and squalor I was now avoiding. I just drifted with events and, for the time being, they treated me kindly. ** Which my father had taken when given a week’s home leave from the Somme in August, the first time he’d seen his family since February 1, 1915. *** In Handel Street, London WC1. For the story of the day he enlisted see Blog posted on September 7, 2014. **** Saint-Omer: a small canal-side town, 30 miles south-east of Calais, close to the North Sea and the Belgian border; the British Army established its “maps GHQ” there in 1915, forming three Field Survey Companies of the Royal Engineers in 1916 with more soon added; in early 1918 the Ordnance Survey, the British national mapping authority, set up an overseas branch in Saint-Omer. ***** Boche: insulting French slang for “German” not used much before World War I, nor since World War II; probably abbreviated from archaic caboche, literally a cabbage, figuratively something like “stupid head”. Next week: Sam works out with some wounded Tommy convalescents, obeys orders like a good boy, still grapples with the emotional conflicts between post-front-line guilt and the joys of not being shot at for a while. A hundred years ago this week… Winter, the great pacifier, brought a degree of relief to Eastern and Western Fronts despite the frostbite hazards. The Battle Of The Somme “officially” concluded on November 18 having proceeded slaughterously since its “official” start date of July 1 – inverted commas because neither could be taken too literally – and the Battle of Verdun (opening salvos February 21) had bedded down bar one pre-Christmas flare-up, while the Russian Army’s Brusilov Offensive’s fizzling after major successes combined with the mid-continental chill to freeze action in that theatre. So the timeline notes mainly record events at sea: a German Naval raid on Lowestoft (November 26) and the sinking of French battleship Suffren (November 26, by U-boat in the Bay Of Biscay), and of British hospital ship the Brittanic (21, by mine, off the Greek island of Kea, heading for Gallipoli so no wounded on board, all but 30 of more than 1,000 crew and medics survived). However, fierce fighting continued in southern Europe. The Battle Of Transylvania, begun by the Romanians on August 27 as an attempt to take historically disputed territory from the Austro-Hungarian Empire, had turned around into an arduous invasion of Romania by German and Austrian forces. They took Craiova (November 21), regained Orsova (22, scene of a Romanian victory on September 8), and advanced on Bucharest via Rymnik, to the northeast (25), although the still defiant Romanian Army repulsed the Germans in the Aluta Valley at Slatina (24), due west of the capital. Down in Macedonia, the Allies’ Monastir Offensive proceeded steadily – if that was still the right name for it, given they’d just captured their objective – with Serbian and French troops pushing the Bulgarians northwards. Also, the provisional Greek Government declared war on Germany and Bulgaria, giving perhaps rather shaky political support to the Salonika-based Allied forces (other contingents there included British, Russian and Italian troops). 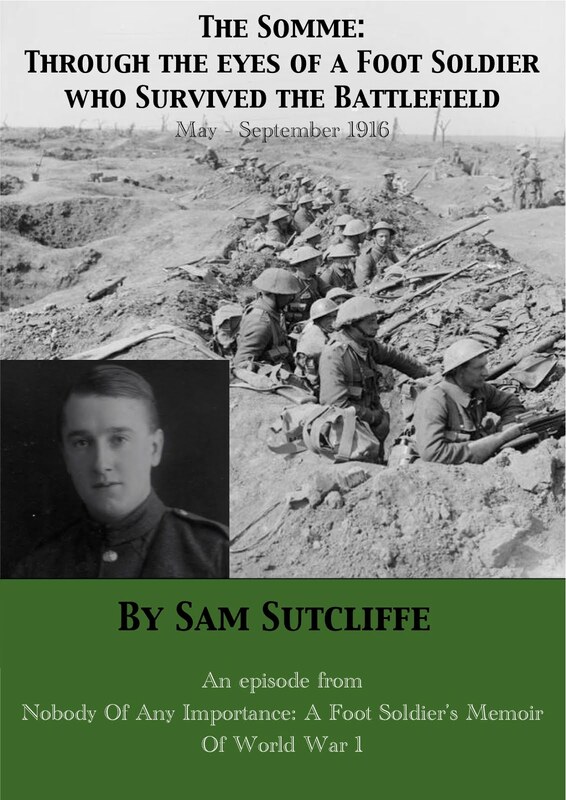 For the last two weeks FootSoldierSam’s blog has been marking the Remembrance period with extended excerpts from my father’s accounts of the first two WW1 campaigns he fought in: Gallipoli and The Somme. Now I’m returning to the 100-years-ago-this-week (give or take) approach FSS is based on. So back to Harfleur and Le Havre where, for a couple of months after the Army’s discovery that, after all he’d been through, he was still under-age for combat freed him from the Front, he worked with a rather Arthur Daleyish character called Archie Barker. This ducker-and-diver of a comrade from his original Battalion, the 2/1st Royal Fusiliers, ran a sort of unofficial caff at Harfleur camp, augmenting the Tommies’ diet with little luxuries such as tinned salmon sandwiches, apple turnovers and fresh fruit (all profits to the Captain Quartermaster, of course.) Sam’s job involved taking a horse and cart into nearby Le Havre every day and buying these tasty extras in the town’s market and grocery shops. ‘It was around that time I had the interesting experience of watching a Frenchman buy a monocle. Barker had asked me, while in town, to call at an optician’s shop in the Rue Tière**. I merely had to collect some spectacles he had left there for repair. While waiting, I noticed a French civilian searching through a box on the counter. It contained wire frames, mostly gold wire, and not for pairs of spectacles, but for single lenses. He selected one and as he tried it in his left eye, I observed that the bottom of it was distinguished by double wiring. He stood in front of the mirror. Down went the jaw as he stretched the skin on that side of his face to its limit. Into the orbit went the frame, the jaw relaxed, and the double wire gripped in a fold of flesh. This went on for some time until he’d selected the one that suited him and handed it to the optician for the lens to be inserted. The fascination to me was this man’s concentration on the job in hand, the careful selection, the serious, searching glance he gave to the reflection in the mirror — his appearance in wearing the thing obviously of the greatest importance, though perhaps it would be of aid to him in reading too. Until then, I had thought only a certain kind of Englishman wore a monocle. But the quantity of frames in that box proved the custom must have been quite common in France or, at least, in Le Havre. Next, the arrival of a newcomer in camp gave him the chance to seek information about his older brother – and hero really – Ted, by then 20. 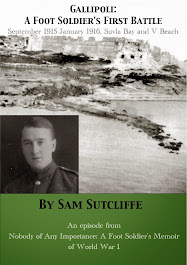 They’d joined the Royal Fusiliers together in September, 1914, but often been separated and Sam hadn’t seen him since May, 1916, when that Battalion, broken down from a thousand to about 250 by Gallipoli was disbanded – to their great chagrin because they had bonded as comrades and trained like madmen to persuade the Army to bring them back up to strength with new recruits. ‘I recognised [the newcomer] as a Fusilier by his badge, and I knew that, after the break-up of our old Battalion at Rouen, my brother had been sent to the original first-line Regiment, so there was just a chance that this newcomer had known or heard of him, even though thousands of men wore that badge. So I asked him about life up front, who was he with, and the long shot came off. He had belonged to the same Company as Ted. I eagerly asked for news and he told me how, in a pretty sharp action, one of our Sergeants from the original Battalion, Billy Wale, had been severely wounded in a very much damaged advanced trench well ahead of the front line***. This soldier had heard my brother say, “We can’t leave old Billy Wale out there. I’m going to get him.” But this soldier didn’t know what happened after that, because he was already wounded himself and stretcher-bearers carried him away. ** This doesn’t appear on a current list of Le Havre streets – closest is Place Thiers, so maybe that’s It, or maybe the Rue Tière has disappeared in the meantime. *** On the Somme, that is, but I don’t know where – if these scant details give anyone a clue then please let me know. Next week: Sam’s catering career comes to sour end – but no worries, his still-underage break from the front continues as the Army sends him back to Blighty, an interlude of home life… and good news of brother Ted!